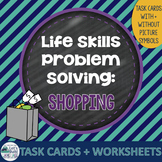 This is a functional problem solving task for adults. 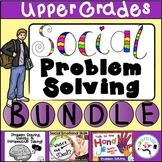 Also included in: Life Skills Problem Solving Bundle SAVE! 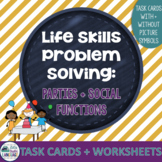 Situational Problem Solving for Upper Grades - Brain Storm! 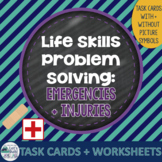 This pack of task cards and worksheet is designed for middle/high school/transition students for practice with functional problem solving for ADLs. 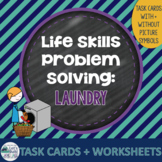 These realistic scenarios will allow your students with autism and other challenges to engage in critical thinking and discussion about doing laundry! 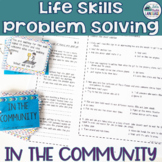 Useful for teaching adolescents with intellectual impairments about where to go when certain situations occur. 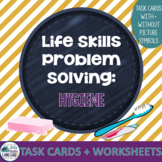 Good for functional problem-solving goals. 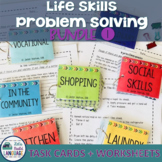 Also a useful supplement for a Community unit. 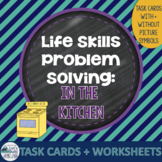 This pack of task cards and worksheets is designed for middle/high school/transition students with autism and social challenges to practice functional problem solving. 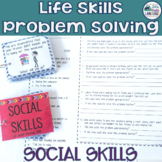 These realistic scenarios will allow your students with autism and other challenges to engage in critical thinking and discussion! 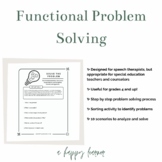 This packet targets functional problem solving skills. 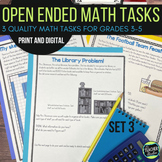 It is best for students who are able to read (3rd grade and above). 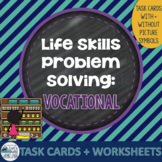 Set Up: I recommend laminating, cutting out the cards, and hole punching the cards. 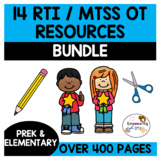 I keep mine on a binder ring. Everything is black and white, so it is easy on the ink!